I’m on vacation! Can you guess where? The perfume of hyacinths floating on cool misty air was absolutely sublime! Even the raindrops are beautiful! Don’t worry, I haven’t turned into an oenophile – I had my beer for an appetizer. 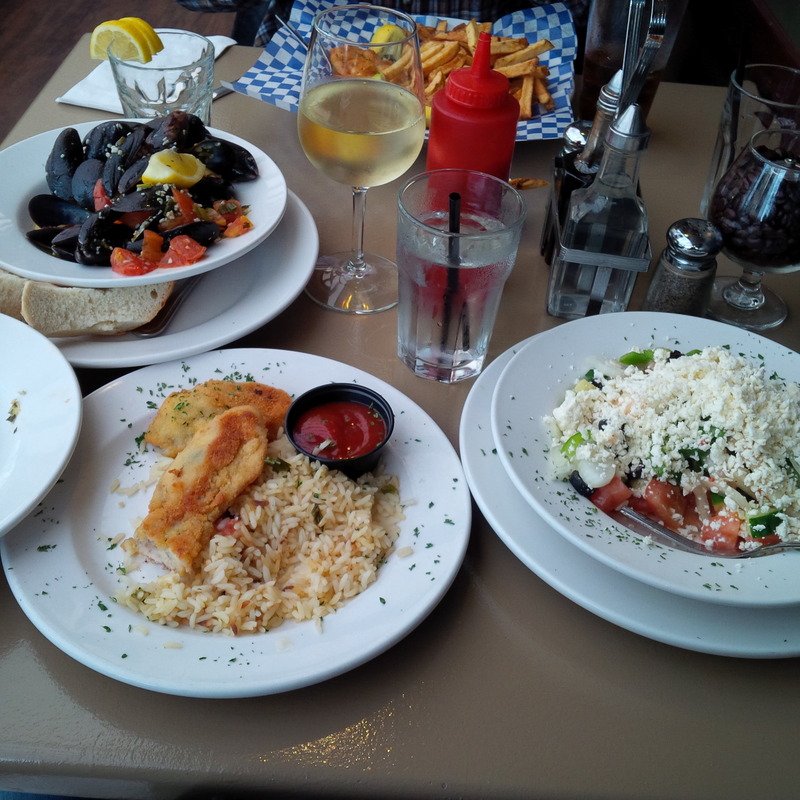 Counterclockwise from top: Painted Turtle Sauvignon Blanc from Oliver BC, Salt Spring Island mussels provençale, pan-fried Fanny Bay oysters, Greek salad. Yum! 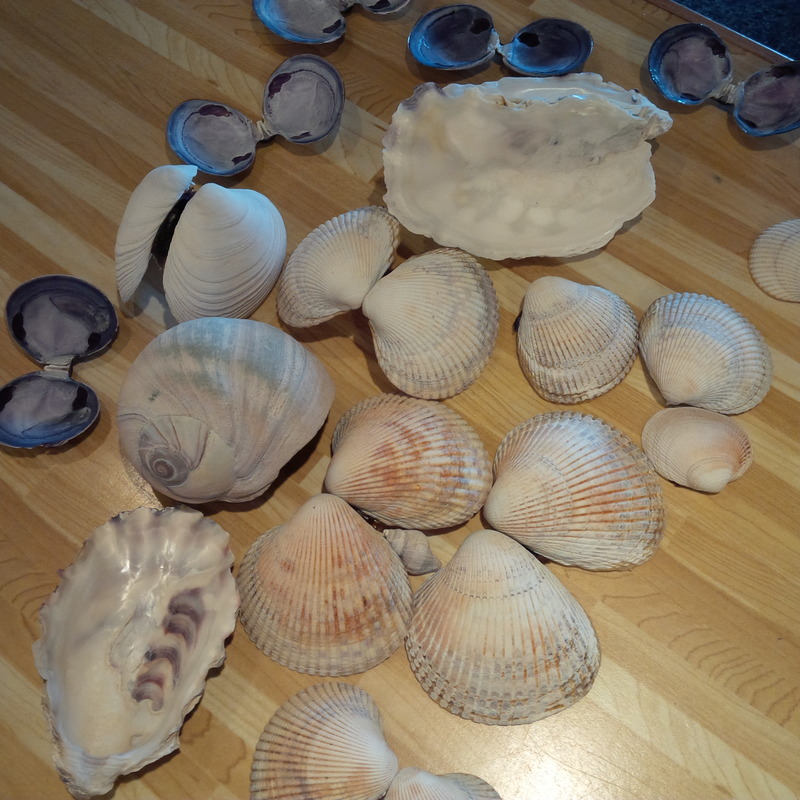 I’m usually not much of a shell-picker, but I’ve never seen a moon snail shell in such good condition. This one’s nearly four inches in diameter. Caught in the act, ice cream cone in hand. But you wouldn’t expect any less, would you? Ready to guess? If you said “the west coast”, you’re right! The first two photos were taken at the Crown Isle golf course clubhouse in Comox, BC. 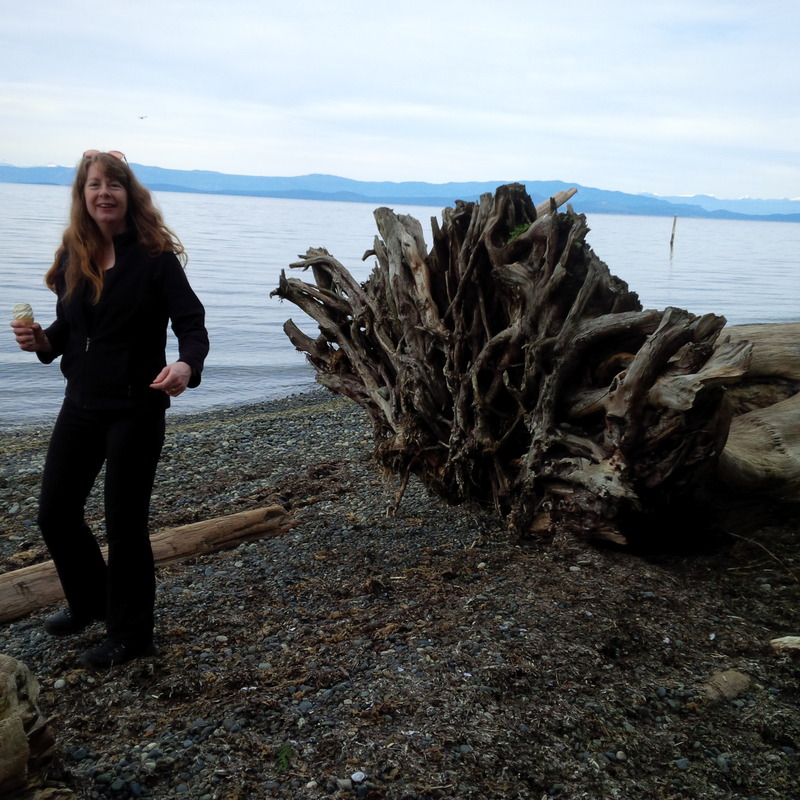 The food is from Deez Bar and Grill in Qualicum Beach, BC, and that’s me on the shore of the Salish Sea, ice cream in hand. 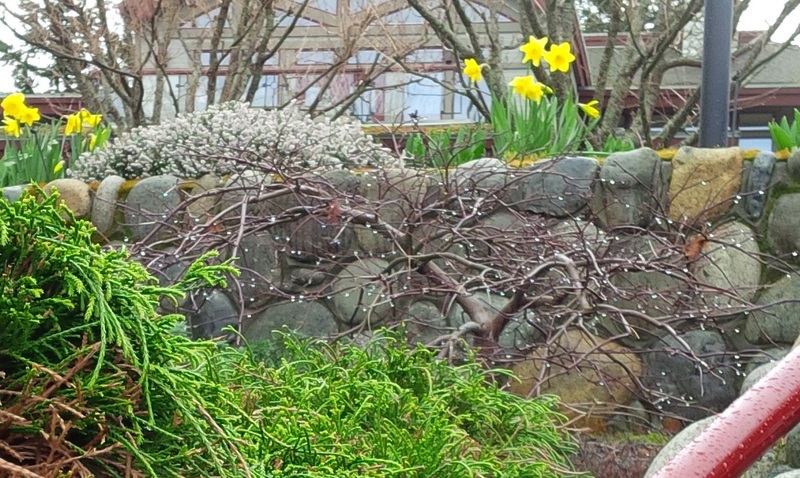 We’re on Vancouver Island for the week, soaking up some humidity and smelling the flowers while it snows in Calgary. Our hotel is right on the shore, and from our window we’ve already seen harbour seals, a sea otter, bald eagles, common loons (the avian variety, though we’ve seen a few of the human sort, too), and thousands of surf scoters, black scoters, white-winged scoters, greater scaups, harlequin ducks, and of course, seagulls. Herring roe is lying in drifts along the shore, and the washed-up seaweed looks as though it’s been encrusted in yellow pearls. (Fortunately it’s not smelly.) I’m envying the stand-up paddleboarders and kayakers, but I’ll save that adventure for another trip. We have lots of day trips planned, but we always have to go to one of my favourite places in the world: Cathedral Grove. This little pocket of old-growth forest is right off the Alberni Highway (#4), an enchanting few acres of giant trees that are hundreds of years old. No matter how often I go there, I still stand in awe. 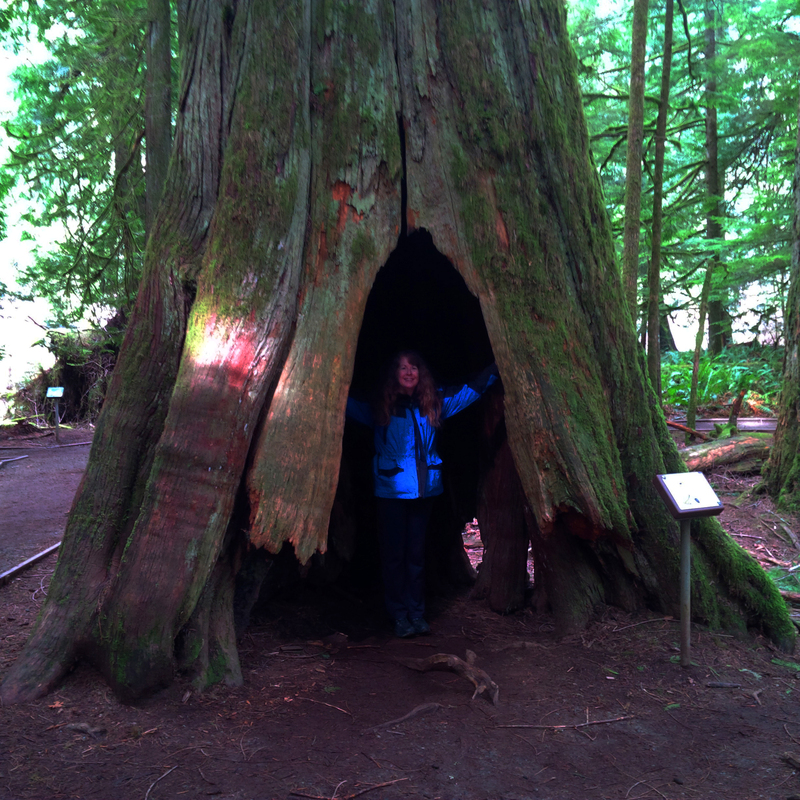 Just in case you thought I was using a bit more artistic license than usual when I described hiding inside a cedar tree in Book 10 (oops; correction: Book 9. I’ve got Book 10 on the brain! )… there’s room to hide an entire baseball team in here! Here we are in front of the tree that BC Parks has designated the biggest, though there are several others close to this size. 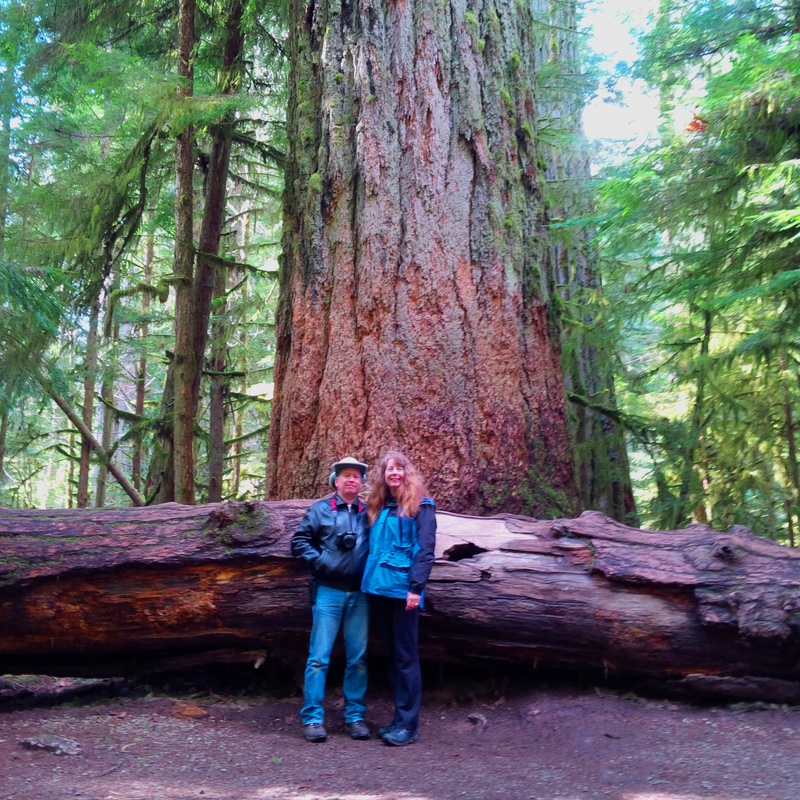 Notice the “small” tree lying behind us – it’s actually the top of a fallen giant, only about 5’ in diameter at that point. Kinda puts it all in perspective, doesn’t it? This sign was placed around 1992, so that means the big guy is coming up on his 900th birthday. Yesterday we made it to the North Island Wildlife Recovery Centre and the World Parrot Refuge, and still on our to-do list are trips to Englishman River Falls, some wineries, and any other interesting side trips that catch our eyes in passing. And best of all, the weather has been perfect so far. As the joke goes, “Weather is here; wish you were beautiful”. P.S. We’re out and about this morning, but I’ll be back to reply to comments later tonight or tomorrow morning. “Talk” to you then! Your picture was easily identified. Looks like you had a great holiday. Very good pictures. You look very relaxed and awesome. I love the Island. 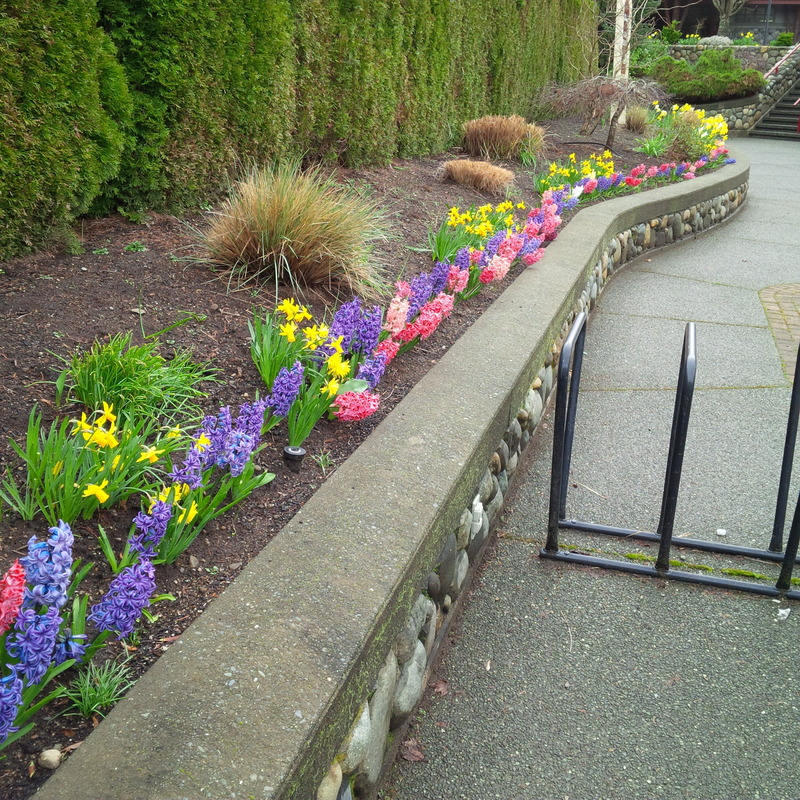 My second youngest is finishing her PhD in English (Victorian) Lit at UVic. Finally! After 7 years. Her defense is April 20. I still have friends there but a daughter is a better excuse. Also my Dad’s one of two remaining cousins is in Comox. She is 92 or 93. On her third husband who is 10 years younger. She keeps wearing them out, I think. Sounds like you’re having a good time, Diane! Those trees are awesome. Were there elves in that tree baking cookies? Enjoy, rest and eat all the good stuff on those plates. Yum is right. Aw, thanks! I think Hubby is pretty cute, too. 😉 And I’m going to have to go on a diet when I get home. I had a fish-and-chips platter last night that nearly killed me. A giant piece of halibut, two great big tiger prawns, and three fat juicy oysters, plus hand-cut french fries. I almost never eat deep-fried seafood because the batter is usually disappointing, but my taste buds thought they’d died and gone to heaven last night. YUM!!! On the other hand, the pictures are great. I hope you both have a fantastic time on your vacation. I’ve never been to Vancouver Islan, but my dad took me to Lopez island years ago. Which was beautiful. Argh! I’m an idiot! You’re right, of course, it was Book 9. I’ve got Book 10 on my mind these days… or maybe I can blame it on ‘vacation brain’. 😉 And thanks, we’re having a wonderful time! I love the island! Wonderful photos and I can almost smell the ocean breeze. That infographic using the leaning Tower of Pisa is excellent. Enjoy! 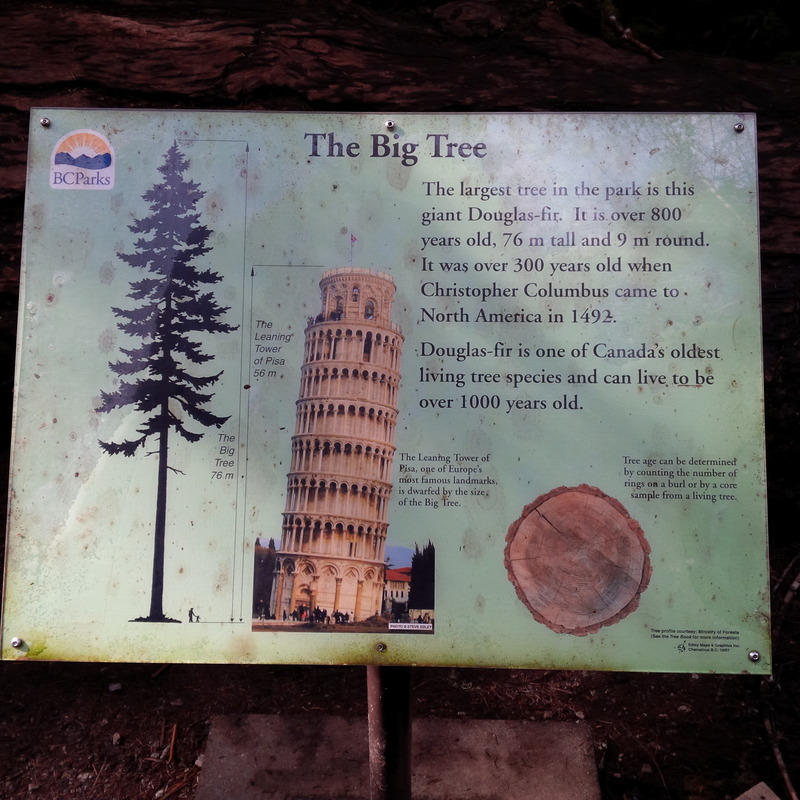 I was thinking of you when I snapped that picture – I enjoyed your Leaning Tower of Pisa post! Jutht cut loothe, and have a thwell time!